​I'm a mom to three growing kids - only one is still a teenager! ​I love chocolate, have a crazy aversion to dogs, feel happiest atop a New Hampshire mountain and still think Parker Stevenson is dreamy. Yes, I was a Hardy Boys fan! When my second child arrived, I became a full time mom. I free lanced as a copy editor for a friend for a few years and I have worked as a substitute teacher in the local elementary school. I love working with my target audience! I sold my first story in 2007 to Clubhouse Jr Magazine after taking the Institute for Children's Literature class. Since then Clubhouse Jr has featured over a dozen of my stories- one coming in May 2019! ​And I've had fiction stories published in Highlights for Children and Girls' World too! A few of those times my story was featured on the cover - so yea, I'm a cover girl! Kelly Carey is an award winning children’s fiction author from New England. Her fiction stories have been published for over a decade in Clubhouse Jr., Highlights for Children, and Girls’ World. Her debut picture book, How Long Is Forever?, illustrated by Qing Zhuang, will be released by Charlesbridge in the spring of 2020. Kelly’s writing received the Higher Goals Award from the Evangelical Press Association in 2008, 2009 and 2015. She is a graduate of The Institute of Children’s Literature and an active member of the Society for Children’s Book Writers and Illustrators (SCBWI). She belongs to The Writers’ Loft in Sherborn, MA and is the proud co-founder of the blog 24 Carrot Writing (www.24carrotwriting.com). She has participated in NaNoWriMo (National Novel Writing Month), Storystorm, ReFoReMo (Reading for Research Month) and Julie Hedlund’s 12x12 Picture Book Challenge. She has attended the New England SCBWI Spring Conference on many occasions, participated in SCBWI’s Agent/Editor Day, SCBWI Encore, and the Whispering Pines Writing Retreat. Kelly holds a BA from Fairfield University in English and Communication. She worked for The Travelers Insurance Company and Tufts Health Plan before becoming a full-time writer. She recently spent five years working as a substitute teacher at Memorial Elementary School in Upton and currenlty conducts workshops on How to Become a Children's Writer for adults and Story Engineer classes for young writers. Kelly lives in Massachusetts with her husband and three children. 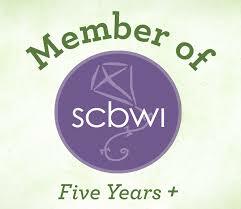 I am an active member of SCBWI, love my 24 Carrot Writing Group and The Writers' Loft. I've participated in Julie Hedlund's 12 x 12 picture book challenge, ReFoReMo, and Storystorm. I attended the Whispering Pines Writing Retreat in 2018 and can't wait to go again in 2019. For three reasons, Steven Kellogg's The Island of the Skog is my all time favorite book. First, it is an amazing story with a wonderful message. As a kid, I loved to study the illustrations. Those pictures tell an entire story within the story. You could explore a single page for hours! Second, Mr. Kellogg lived in the same town where I grew up. Discovering that someone who lived in my town could write a picture book made becoming an author seem possible for me too! ​Finally, I love this book because it is the first book I ever owned that was signed by the author! Look! There is my name in big bubble letters and Mr. Kellogg even drew me my very own Skog!